Once every twelve years, in the southern part of the Indian peninsula, millions of people congregate at the temple town of Rajamundry, on the banks of the mighty river Godavari. 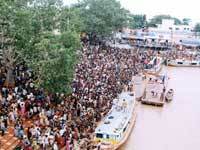 They are consumed by only one desire: to take a dip in the Holy river during this auspicious period called Pushkaram. 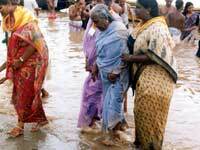 The Hindus believe that a dip in the Godavari during this period rids one of all impurities: physical and mental. This of course is in consonance with the Hindu practice of revering all aspects of nature as a direct manifestation of the Divine. Whatever may be the other religious or spiritual reasons for this event, the fact is, that over a period of 12 days, in the month of August 2003, specific spots along the banks of Godavari witnessed a convergence of lakhs of people everyday….yes, lakhs of them everyday! Imagine the consequences of such an event. The very numbers implied a system operating on the edge of chaos…with every possibility of things going wrong: stampedes, public health disasters, and deaths by drowning. Moreover, majority of the devotees who came there belonged to the poorer sections of the society; with just a pair of clothes, little for their food and a bounty of faith! The government, of course, did its best to organize this mega event. But it had its own limitations as far as the resources and manpower was concerned. 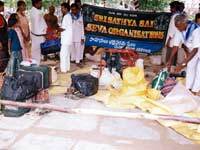 This was where many voluntary groups swung into action and foremost on the list was the Sri Sathya Sai Seva Organization of Andhra Pradesh. On the 29th of July, 2978 volunteers of the organization gathered at the Sathya Sai Gurukulam at Rajahmundry and made a commitment to unto themselves: 'We shall see SAI in every pilgrim we encounter and serve him/her to the best of our capacity'. Several months of planning had gone into this event. All the raw materials were ready. Three buses and four trucks were in place, ready for use. Every volunteer was given specific duties at specific locations. The service was to be rendered in turns by batches of thousand volunteers (600 men, 400 women), for a period of four days each. 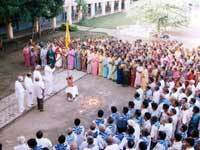 Taking the name of SAI, the volunteers plunged into service. One could see SAI volunteers wherever one went. As soon as one walked into bus terminals and railway stations, volunteers offering service in the free cloakroom facility welcomed them. There were others who gave guidelines on how to reach the bathing ghats. The volunteers were there near the bathing ghats too, maintaining cleanliness and helping the old and the disabled to take a dip. They took care of the children when the parents went for their holy dip. They prevented stampedes by helping police maintain the queue. There was no outbreak of any kind. 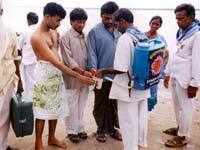 Volunteers supplied pure drinking water, carrying water tanks on their backs. 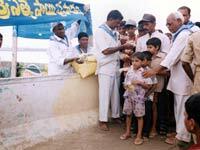 Medical camps were organized on the banks to tackle any health problems. Others were seen cleaning the river water of the offerings that the devotees made. Some others were busy elsewhere preparing large quantities of food, which was given away in the form of packets, free of cost, to the pilgrims everyday. The total number of packets given in these twelve days was a staggering 3,27,750! The numbers would surely have impressed you too. But there was also quality to this quantity. 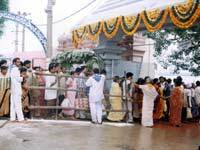 The pilgrims and the newspapers were all praise for the wonderful service rendered by the Sathya Sai Seva Dal. In response to all this one of the young volunteers from Rajamundry remarked, " We only pray that this little act of serving His devotees, has pleased Bhagwan!" Not many of us get a chance to serve the Lord directly…but a service to those who seek Him, is by itself service unto Him! If you have stories from your land, where your people have touched the lives of others in any little way through their service and love…let us know about it. We seek your inspiration on this path, too!